Steel-making put Sheffield on the map as one of England’s main industrial city's during the 18th, 19th and 20th Centuries. Today in the 21st Century, Planet X hopes to re-vive our beloved city's rep; not only by paying homage to the roots of the Steel City but by offering you, our customers, some of the best high end bikes, made from top quality steel at unbeatable prices. We don’t do things by halves at Planet X and so it goes without saying that we endeavour to use the best materials that we can get our hands on. Our steel frames are the epitome of this company value. The Evo2, Inbred and 45650b are made from 4130 chromoly (a mix of Chromium and Molybdenum), which creates a strong and highly durable frame; not something which will be found on entry-level bikes. The fact that 4130 chromoly has better ultimate tensile strength and Youngs modulus of elasticity means that we can use less of it to create a lighter frame without compromising the bikes durability. But we don’t just stop there. The frame tubes, categorised DN6, are double-butted to optimise strength and keep the weight down by having thicker tube ends, to support the stress of the welds and thinner centre section. 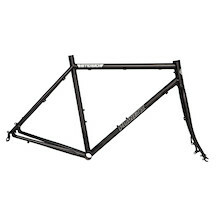 If you haven’t tried a steel frame yet then you don’t know what you are missing. A steel frame allows for a comfortable ride due to its ability to flex, hence the reason why so many people say that the ride quality is unmatched; particularly in comparison to it’s more recent competitor, carbon, which provides a stiff frame for increased efficiency in power transfer. But ultimately it is for you to decide. So take a look at our many great deals on steel frame bikes and try one.